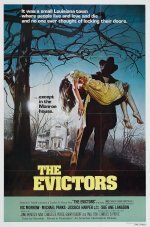 This uneven mix of Old Dark House chills and Texas Chain Saw Massacre shock tactics plays on the fears of all new home owners: that their dream house may be hiding a terrible past. When city newly-weds rent a lonely farm in an isolated village in Arizona, the locals view them with distrust, while it appears the previous owners are refusing to stay buried. Director Charles B Pierce generates a convincing sense of place and community amid the requisite splatter, and the final twist is just good enough to catch you off guard. Ultimately, though, this isn't strong enough to escape being a rehash of all-too-familiar elements. This was one of Vic Morrow's final films before his tragic death in 1982 on the set of Twilight Zone: the Movie.